I love to discover editions in the collections that have what I call “integrity”. Over and above being rare or fine, they must be distinguished in other ways. Chen Yuan (1880-1971) was a native of Xinhui county 新會縣 in Guangdong province 廣東省. He received a classical Confucian education and sat the provincial examination. I haven’t been able to establish when and where, but it was probably the last such examination to have been held in Canton. His paper, and the conditions under which he was examined, would have been exactly as described in my blog entry for the recent exhibition in the Bodleian Library’s Proscholium. He failed, but like many such failures, subsequently distinguished himself far more in the field of letters and scholarship than he would have done in officialdom. Perhaps it was this failure, together with the realisation that the old order was fast disappearing, that made him change direction completely. He began by founding the pictorial magazine Shi shi hua bao 时事画报 in Canton in 1905, and two years later in 1907 enrolled at Guanghua Medical School 光华医学院, where he graduated in 1910. Having fallen under the spell of Sun Yatsen, at the beginning of 1911 he co-founded the Zhen dan ri bao 震旦日报 with Kang Zhongluo 康仲犖 and Liang Shenyu 梁慎余, and later that year, following the success of the revolution became a representative in the National Assembly 國會 in Peking. Although he eventually became Deputy Minister of Education in 1921, he left politics soon after to pursue an academic career which he had been developing in parallel during the 1910s. His two interests were history and religion, and his first major work – the one that launched his scholarly career – was his Yuan ye li ke wen kao 元也里可温考, which he completed in 1917. This was an investigation into the Nestorian Christianity of the Yuan period, the term ye li ke wen 也里可温 being derived from the Syriac term arkagun, meaning “blessed people” (Syriac was the official language of Nestorianism). In 1919, he became a Christian himself. His interest in the Mongol period continued, as evidenced by the production of the present work (“The sinicisation of the Western Region peoples during the Yuan dynasty”), Sinica 2589, about which more in a moment. After resigning from politics in 1921, he founded Peking’s Pingmin Middle School 平民中学 (the present Number 41 middle School 北京市第四十一中学). And then, although he was a Protestant Christian, he became the second president of Fu Jen Catholic University 輔仁大學, a post which he held from 1926 until the closure of the university by the Chinese government in 1952, and the forced merger of its departments with other universities in Peking, notably Peking Normal University 北京師範大學 of which Chen Yuan continued to serve as president until his death in 1971. 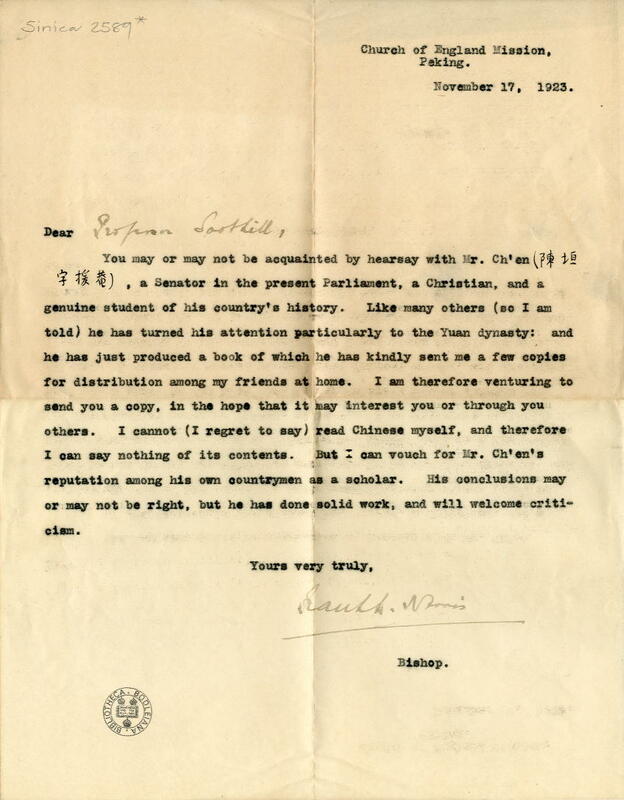 Chen Yuan was almost an exact contemporary of Chen Yinke 陳寅恪 (1890-1969), and the two were of equal scholarly fame, becoming known as “the two Chens of historical studies” 史學二陳. So in what way does Sinica 2589 have “integrity”? Firstly, it is in near perfect condition, and preserved exactly as published. Secondly, it is rare. 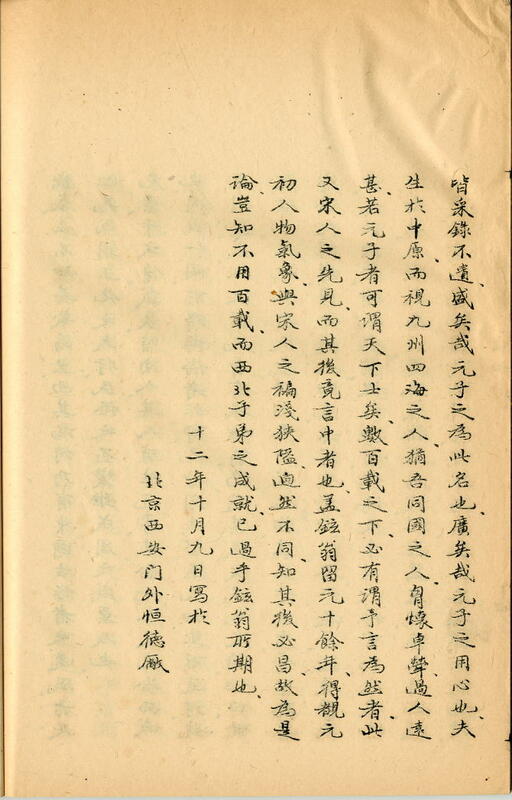 As its title suggests, it is the first draft of a work which the author later printed by woodblock in 1934, without the additional words gao ben 稿本 in the title. This first “real” edition of the work is very common. In this printing process, a stencil bearing the text (produced either by a typewriter or as here, by hand) is mounted on a drum, and an oil-based ink is forced through it on to the paper, which is why the Chinese term for the process is “oil-printed”. The drum is turned by a handle and the paper is automatically fed through the machine. Nevertheless, it is a crude, home-made method, and only suitable for relatively small print-runs. 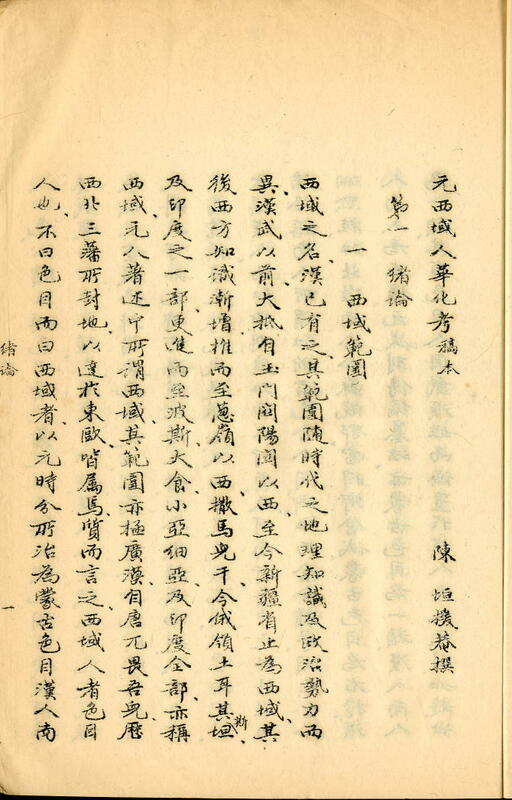 For this reason, Chen Yuan’s first draft of this work is rather rare. I have only found fourteen other copies, of which all but one are in China, and of these, four are in Peking University Library and another four in the National Library. Clearly, it was not distributed widely or commercially. This leads to the third reason why I consider our copy to have “integrity” – its provenance. We know exactly where it came from. There is a letter accompanying the book that tells us that it was given to us by Bishop Frank L Norris in the same year as its publication. Francis Lushington Norris (1864-1945) was an SPG missionary, who became Bishop of North China in 1914, retiring in 1940. As a recent convert, Chen Yuan must have known him, and given him a copy of his work. 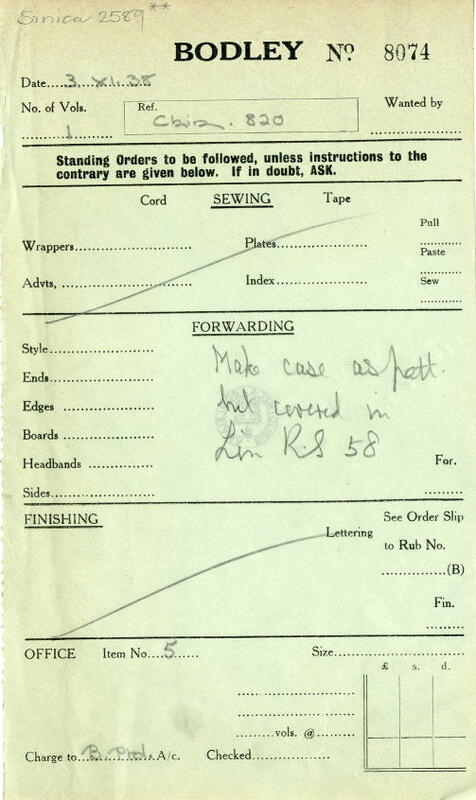 Yet again, it is evident how much we owe to the missionaries – it was another, Arnold Foster, who sent us the juren papers a decade or so earlier. Fourthly, and finally, also accompanying the book there is a Library binding order dated 3 November 1938, or rather not a binding order, but an order for a Chinese-style wrap-around tao 套. Of the thousands of pre-modern books in our collection that I have handled, this is the only such order that I have discovered, and it is very interesting because it provides the exact date when this, and by association the other wrap-around tao were made. One could expatiate on the appalling practice of giving western bindings to traditionally bound Chinese books, but for the moment it is sufficient to say that at the Bodleian, it was rarely done. Perhaps we never had the money for it, or perhaps we were ahead of our time in knowing it to be bad. Whatever the reason, I’m glad I don’t have to think of how to rescue the thousands of Chinese books in richer places whose heavy western bindings are now wrecking what they were supposed to protect.